Guest post by Jon Trickett, Shadow Minister of State for the Cabinet Office. He has been the Member of Parliament for Hemsworth since 1996. Rebuilding our covenant with the British people will require some tough decisions and an up-front acceptance of the things we got wrong. The Party stands at a cross roads. We reject the turning towards 1980’s style ultra-leftism. Equally we should refuse the call from a voluble minority of backseat drivers who would turn Labour to a pale blue echo of Toryism. Our future lies in opposing the Tories not mimicking them. Equally it means embracing the mainstream concerns of the majority. Unity is Strength. So said the ancient trades union and labour movement banners. Our leader has laid out a path forward which we can all support. The electorate will reward a unified party which knows which direction it wishes to take the country. This is particularly so given the splits in the coalition. But identifying mainstream concerns and transforming our party will require discussion and debate. Conducted in a tolerant, open and democratic way, discussion will enhance our capacity to win. Progress, New Labour, Compass and Blue Labour have all made valuable contributions to the debate and other voices need to be heard too from beyond the Westminster village. It is fascinating, for example, to see the emergence of Winning Labour (www.winninglabour.org) based on a group of activists in Yorkshire. Equally a group of Young Compass committee members have now become “Next Generation Labour”. Frank Dobson MP has initiated discussions amongst Labour MP’s which will analyse the growth of inequality and advocate a more equal society. And a group of MP’s, under the title Working Labour, is starting meet to look at how the Party can reconnect with working people. The debate which these and other initiatives will engender within the Party will help us to renew ourselves but such debate must not be rancorous, factional or divisive. There are several issues which will need to be addressed in this debate. In recent decades mainstream progressives on both sides of the Atlantic lost our way. We lacked confidence in our capacity to win a popular majority for our values. First Clinton and then Blair pioneered ‘triangulation’ that we must shift to the right in order to win. The electoral demographics of this politics involved a laser-like focus on the so-called middle income ‘swing voters’, assuming that the ‘core vote’ among manual workers would continue with their historical attachment to parties of the centre left. And so ‘New’ Labour followed on from the New Democrats and the Third Way was born. Both President Clinton and Tony Blair won famous elections. Much was achieved. But in the end they lost touch especially amongst people on middle and lower incomes. Yet it is not clear, even now, that Conservative, or “Blue” social values, are as hegemonic in our society as is being argued by some. It would be foolhardy to underestimate the strength of the right, but equally we should not base our electoral strategy on an overstatement of the Conservative strength. Consider the following: the Conservative vote under Major and Thatcher never really fell below 13 million but since then has never fully recovered. Even in 2010, Cameron’s Tories only gained 10.7 million votes, over 2 million behind their historic vote. Indeed, astonishingly, their share of AB votes actually declined from 41% in 1997 to 39% in 2010. Whilst David Cameron significantly outpolls his party, the Conservative brand remains toxic to many. It is instructive too that the Tory parts of the Coalition have not felt confident to press ahead in the short term with many of its clearly ideological project: the transformation of the NHS into a privatised service, the sale of the forests and the suggestion that they would privatise whole sections of the civil service. We should not conclude from all this that right wing ideas can be ignored as Labour rebuilds. But nor should we be mesmerised into thinking that it is necessary merely to track rightwards in order to win. Labour’s immediate task is the rebuilding of its own electoral base. There are still some strategists who insist that we should focus exclusively on the ‘swing‘voters. They are wrong. When analysing Labour votes by social class over the New Labour years and comparing 1997 with 2010, we lost 4.1 million votes among manual workers but actually gained 120,000 professional classes. Early signs of some recovery of the labour vote under Ed Miliband’s leadership should not be taken as an indication that all is now well. Widespread hostility to the Coalition’s more right wing initiatives does not mean we have won the argument. For great scepticism about Labour remains based on our time in office. The Tories are flat-lining at under 40%. People don’t buy in to their politics. There is a clear non-Conservative majority in the country. But if this majority is divided then Cameron can win a majority in a first past the post electoral system. The Tories understand this. Why else would the Murdoch press argue for a vote in Scotland for the SNP? Their strategy is to ‘balkanise’ the non Tory majority. Labour’s response must be to create a majoritarian politics, sensitive to local and regional as well as class, gender and other identities, but which speaks to the country as a whole. For the truth is that the Conservatives do not offer a vision of the future which speaks to our sense of optimism and hope. There is a sense in the country that as a nation we have lost our, and that so many communities are insecure and facing a future which is bleak. Whilst retaining the support of more affluent voters (and indeed strengthening our support), Labour must first understand, and then reconstruct, its relation with the C2DE social groups where the rupture with New Labour was the greatest. We must also understand the reasons for the regional differences in that vote for in the South it does seem to be the case that there is a currently less strong propensity to vote Labour, whilst in Scotland and elsewhere there are different challenges. This will require a process for Labour as profound that as the creation of New Labour. In my view Labour will need to be more than a party which re-finances the public services, we need to develop a new Political Economy which rejects the values of the casino and instead rewards hard work and thrift and one which also addresses the question of production as well as distribution. Our economy is less productive because of a huge collapse in investment, and the sources of finance for investment have been based on short-termism whilst the economic sectors into which finance has been investing are too narrow to prepare us for the new global challenges. Re-founded, Labour must draw together the various progressive strands in the wider society and which form a majority. We can be optimistic that we can win because there is a progressive majority in the country. To do so we must show that we are serious about liberty and a democratised state, the environment and about low wages, working time, inequality. As Ed Miliband once said ‘Heart and head come together in a politics based on clear values’. This article is derived from a speech Jon Trickett gave at the Leeds Civic Hall on 9 July 2011. “Blue Labour’s line on immigration is toxic.” That was a headline I woke up to this morning. I greeted it initially with some disbelief for the simple reason that I didn’t know there was a “Blue Labour line” on immigration. But then I realized that it came on the back of an incendiary Daily Express front page citing an apparent report produced by Maurice Glasman for Ed Miliband calling for an immediate moratorium on the vast majority of immigration to Britain. There is no such report, of course. That was a fiction in true Daily Express style. But Maurice Glasman has nonetheless made a series of comments in interviews with the Fabian Review and with the Guardian this week and so the story begins. What must be made entirely clear, though: this is Maurice Glasman’s view and not the view of others who have been associated with the debates around “Blue Labour” or who contributed to the e-book, The Labour Tradition and the Politics of Paradox. Those debates have not been programmatic statements of policy positions, and certainly not recommendations for areas of policy as deeply complex and controversial as immigration. They have concentrated on just one thing: how can Labour restore its democratic tradition. In these debates, Labour people like Jon Cruddas, Jonathan Rutherford, James Purnell, David Lammy, and Tessa Jowell have been calling for a more relational, open, truly democratic politics in Labour. All of us involved have shared a desire to build a politics that starts from people’s everyday experiences and encourages the citizens of Britain to come together to campaigns for a better life together. It is a politics that celebrates the trade union and co-operative heritage of Labour, and that recognizes in movements like London Citizens the possibility of recapturing the best of that tradition today. It is a politics that has strong resonances with Ed Miliband’s recent insistence that social responsibility and a radical attack on concentrations of power should be at the centre of Labour’s agenda. In my view, this kind of politics is peculiarly ill-suited to a policy of dramatic immigration restriction. The British Labour tradition is an open, tolerant, and welcoming one. It is one which, as Maurice Glasman himself recognises in the e-book, has a strongly internationalist as well as nationalist dimension. That is not to say, of course, that Labour should proceed towards a politics of fully open borders. That is a utopian abstraction. Nor is it to say that Labour has ever properly put its case on immigration straight to the British people, as it surely must. But it is to say that a politics of the common good, one that is grounded in relational obligations, sceptical about the domineering power of the state, sensitive to everyday experience, and open always to democratic renewal, should be an instinctively generous politics and not a restrictive one. Labour needs to recommit itself to its co-operative, democratic tradition. This is a real and practical call. We have seen the merits of it in the leadership Ed Miliband has shown in the last few weeks in taking on the Murdoch empire in the name of social responsibility. Labour also needs open debates on difficult questions, of which immigration is very high up that list. But for that open debate to flourish we need to be absolutely clear about where each of us stands and about how our values relate to our policies. That clarity has been obscured this week. It is time to restore it. The crisis News International has created is unprecedented, but it isn’t unparalleled. The abuse of power by unaccountable big business, reckless and corrupt practice and a Parliament that for too long was enthralled by its allure rings as true for News International as it did for the banking crisis. Four years on can we honestly say the banks have learnt their lesson? They remain unbroken, the bonuses are back and they’re slowly regaining the influence over Parliament they once held. We have an opportunity to learn from past mistakes. Not just those of the corporations but the failure of government and indeed our own collective individual failures that have contributed to this latest crisis. If these crises can teach us anything it is that light-touch self-regulation does not work. Just as the banks were allowed to get away with malpractice so too was a blind eye turned to the behaviour of News International. For some Tories, Orangebookers and Blairites this was a question of ideology, of rolling back the state. But in a liberal democracy all power must be accountable. A sovereign Parliament should be the ultimate power, legitimised and accountable because of its election. It is therefore its duty to ensure that the unelected but hugely powerful are accountable to Parliament and thus the people. Power was perhaps the reason that so many held back from interfering with the banks or the press. There was an ingrained culture that held that big business and the Murdoch press were essential for electoral victory. Some merely kept quiet while others actively courted them. There was almost a sense that these bodies were more powerful than Parliament itself, that taking them on would be futile and potentially disastrous. With its infiltration of the police and civil service I cannot doubt that some MPs were silenced by blackmail or worse still payment. Parliament must learn to regulate better but perhaps more importantly actually be aware of its own power. The banks and Murdoch failed, the public were outraged, and Parliament stepped in. The myth that big business trumped Parliament’s power was exposed, our MPs must never forget the lesson and responsibility that this gives them. The proposals to break up the banks seem to have remained such. Ed Miliband’s own campaign to break-up Murdoch’s media hegemony must not be allowed to fail. The lesson for business is clear: monopolies and lack of accountability incite malpractice and encourage a sense of invincibility that sooner or later will be revealed as false. Far from stifling competition sometimes government must encourage it, never is this truer than with our press. This scandal provides an opportunity to rebalance our media, making it more plural and rewarding the publications that respect the law. News International will be the paradigm of pride before a fall in business, a lesson for all. The very real anger at the banking scandals seemed to come to nothing. We must harness our shock now and use it to legislate for a better and more accountable system. We must also look to ourselves. We can’t sit back and feel happy enough to blame Parliament, the banks, News International, when so many of us to varying degrees have played our part in these crises. Just as our demand for endless credit, cheap goods and property contributed to the banking crisis so too have so many of us played our part in Murdoch’s empire. The huge popularity of his papers has been because of the demand for gossip and scandal. Stories that have torn people’s lives apart but have been voraciously read. How many have decried Murdoch but paid their monthly subscription to Sky? Make no mistake, we are not the perpetrators, but we have at times been complicit. As consumers and as citizens we have the power to change the poisonous culture that has infected Parliament and society at large. Personal responsibility when replicated en masse can make a huge difference. Just look at Liverpool where, following Hillsborough, you’d be hard-pressed to buy a copy of what they call ‘the Scum’ in any decent newsagents. I haven’t given up on a fresh approach to the banks but time is ticking. Meanwhile a cleaning up of our press and the culture that’s gone with it is surely best achieved while the hammer is still hot. There are lessons to be learnt from how we dealt with the last crisis, lets then hope that Parliament, business and we as individuals try and act upon them. Culture is far harder to change than procedures; this is a one-off chance to make a change we desperately need, let’s get it right this time. “Blue Labour is a form of contemporary feminism,” Maurice Glasman argues, in a conversation to be published in the first issue of the Fabian Women’s Network (FWN) new magazine this September. Glasman’s stirring claim may come as a surprise to his more vocal critics, who have been asking where (if anywhere) women fit into the Blue Labour project. The encounter was a great opportunity for FWN to start off a conversation that can test and challenge the faultlines of the Blue Labour and feminism debate. Blue Labour's discourse originates from a radical critique of the way capitalism has exploited workers, reduced people to commodities and deprived them of what they need for their life to feel worthwhile. It argues the case for some of the more traditional aspects of community life and empowerment that existed at the time of the founding of the Labour party, which lies in workers who, through organisation and strong relationships, can be a resisting force against the power of markets and financial capital. The main objection to Blue Labour has been that it is a male dominated affair, with a male vocabulary, which totally fails to acknowledge how feminism and women’s participation in work and public life have changed politics and society. Blue Labour places a strong emphasis on communities – as the places where individuals engage in relationships with others and nurture their sense of belonging. Seemingly solid ground. But the centrality of ‘communities’ and 'relationships' is highly problematic when it doesn’t acknowledge that women only thrive when their rights belong to them irrespective of the community to which they belong, the religion they profess, or the family they happened to grow up in. As Helen Goodman has highlighted, dismissing the role of the state too quickly is very problematic for women, as they find that winning their struggle for emancipation relies on a government embracing the idea. Progressive governments create welfare and work policies, instigate vital legislation to tackle abuse and promote political participation through quotas. Maurice Glasman has welcomed the challenge to talk to FWN about what he calls a ‘misunderstanding’, and the conversation offers fresh insights into Blue Labour’s approach to women’s equality. He stresses that he believes women are central in Blue Labour’s vision, and how that vision itself would not be possible without the influence of the feminist movement and its literature. He concedes Blue Labour is still a “new baby”, an ongoing work that probably still needs to fully develop its vocabulary and ideas. During the conversation it emerges that the point of contact between Blue Labour and feminism is the breaking up of the distinction between the public and the private spheres. This is crucial in Glasman’s discourse, which he claims gives it an inherently feminist nature. He says women need to gain power in both spheres. In the public sphere, it is a matter of increasing women’s assets, financial power and independence, identifying tools to achieve equality at work and finding forms of welfare to transfer money directly to women. In the private sphere, it is a matter of how to honour women’s choices and redistribute power within families and relationships such that the burden of care is no longer left on women. This calls for greater involvement of men in private life. Paradoxically, Blue Labour claims to advocate for more ‘public space’ for women and more ‘private space’ for men. Glasman himself uses a vocabulary which is really dear to the feminist tradition, words such as ‘relational politics’, 'reciprocity' and ‘redistribution of power', and these concepts are central to Blue Labour's discourse as a whole, not just when it comes to women. Other contentious issues still remain, and they relate to both the theoretical and the practical side of Blue Labour. For example, a lot needs to be discussed in relation to another of its key concepts, the common good, and how it is negotiated. In particular, women need non-negotiable values, as they are essential to them: past history and today’s newspaper headlines remind us that, even when established, women’s rights are always very tenuous. But probably the most complex and unpredictable outcome is what policies might be born out of Blue Labour's ideas. Glasman says that now is the time to think, and he is probably right, as complex times demand innovative answers, not rote responses. It remains to be seen how this debate will develop further. But there is no question that Blue Labour, like any voice within Labour today, needs to advocate principles of equality that take the debate about empowerment and gender roles forwards, not backwards. This week the TUC launched a new report - ‘Can Housing Work For Workers?’ - by James Gregory of the Fabian Society. The report finds that home ownership and economic ‘independence’ do not necessarily go hand in hand. In many cases, economic immobility is a problem shared by working home owners and those in the socially rented sector. In 2007, with the publication of John Hills’ report into the future of social housing in England and Wales, policy-makers and politicians finally came to the realisation that they could no longer ignore the relationship between housing and employment policy. In response to Hill’s clear analysis of the prevalence of worklessness in social housing, politicians, think-tanks and policy makers rushed to suggest ways in which we could and should ‘join up’ our policy interventions. There have been some successes, notably the housing association led drive to offer employment services to their tenants. And few in the policy world could not now be aware of the perils of building concentrated social housing in isolation from key services and viable labour markets. Yet the belated realisation of the interaction of housing and employment was only ever partial. Crucially, both private renters and owner-occupiers have been excluded from this new policy consensus (though the labour market impact of recent benefit reforms on the private rental sector could be profound, forcing households into cheap accommodation in areas with high rates of unemployment). Why is this? The short answer is that a majority of the policy elite are still beguiled by the British ideology of ownership and ‘independence’. This means that owners are free from the need for state support, and are free to exercise choice about where they live and work. But – as I argue in a new TUC Touchstone report- both of these assumptions are based on myth. Many owner-occupiers are far from being independent, or if they are they suffer for the privilege. And for many households owner-occupation can hinder movement within the labour market. “When we extrapolate the total numbers from these proportions, what we find is that after housing costs there are a total of 3.1 million working-age individuals in owner-occupied housing that are experiencing poverty. Of these, 2.1 million (27 per cent of the total number of working-age individuals in poverty) live in an owner-occupied and mortgaged home. These are serious numbers, directly comparable with the 2.6 million working-age social tenants living in poverty”. There is something about the nature of our labour markets that can make the owners that are active in the labour market vulnerable. By this I do not mean simply that the loss of a job is a key trigger for poverty (of course it is). More subtly, we are seeing more and more workers on ‘flexible’ contracts with flexible hours, placing great pressure on their ability to meet housing costs in a sustainable and predictable way. This should force us to confront a major political and policy question: why have we spent the past 20 years actively pursuing ‘flexible’ labour market policies whilst, simultaneously, seeking to push more and more households into homeownership? The answer to this question lies at least in part in our second myth, that owner-occupation is a vehicle of social and labour market mobility. Part of this myth rests on a view of the potentially transformative effect of assets and property. Homeownership is often thought – perhaps most famously by Margaret Thatcher – to positively nurture individual independence. Many on the left – notably advocates of ‘asset-based welfare- have also bought into this vision over the last ten years. Asset-ownership, it is thought, gives us confidence and makes us less risk-averse and better able to take risks with our careers. In other words, it’s not just that we don’t need to worry about homeowners because they are independent; we can increase the number of ‘independent’ households (and individuals) by encouraging more people into ownership. Yet there is actually very little robust evidence to support this argument. Where there have been attempts to establish ownership as an independent variable in the assessment of individual wellbeing the results have been weak. Typically the households under the microscope were owners because of the type of attribute that some expect ownership to foster; greater confidence, higher incomes, better educations – all these tend to be the variables that lead to ownership, rather than being produced by it. And to the extent that there is evidence in support of the transformative potential of assets, it has actually been based on relatively small amounts of wealth (as little as £300 in savings or a £5k inheritance). There is very little reason to extrapolate the same conclusions when we are considering the effect of the large amount of wealth invested in a home. Indeed, it strikes me as something of a leap of faith to think that just because a small nest-egg creates the confidence to take a risk (setting up a business or taking time out for training) the same can be said when one’s home is at risk. After all, the order of risk here – what we stand to lose – is dramatically different. Much of the evidence with regard to ownership suggests that the opposite is actually true: high transaction costs and psychological attachment can make owner-occupiers more risk averse and less economically mobile. This is borne out by our TUC polling, which found that one in six mortgagees (16 per cent) have turned down a job because of the pressure to keep up with their housing costs. A further 1/8 said that they had turned a job opportunity because of the ‘hassle’ of moving. This brings us back full circle to the 2007 Hills report. One of the problems it highlighted here was the immobility of tenants in the social sector, unable to move to look for or take better job opportunities. For many, homeownership has a similar impact. This matters for the economy as a whole, as we risk a repeat of the slow labour market recovery of the early 1990s, when greater negative equity compounded the inherent immobility of many owner-occupiers. At the time we also saw a very real manifestation of the way in which housing booms can create a broader economic bubble, with a sometimes illusory sense of housing wealth underpinning a consumer driven economy. As we may well see again, a loss of confidence in the housing market can hit this kind of economy hard, along with the employment prospects of many in the labour market. So housing matters for workers and their prospects in life, and it matters just as much for many owners as it does for renters. There are a range of conclusions we could take away from this. Three stand out. Firstly, we should be far more circumspect about the desirability of pushing more and more households into owner-occupation. Secondly, we need a more sophisticated range of policy responses for home-owners, offering similar advisory services (for example on debt and training opportunities) that are often available to social tenants. Crucially, this advice needs to be available long before the crisis points of unemployment or repossession. Our TUC report offers a range of proposed responses to these first two challenges. Finally, we need to stop telling ourselves that there is a clear hierarchy of tenures, with ownership at the apex and social housing at the bottom. James Gregory is a Senior Research Fellow at the Fabian Society. Ed Miliband is politically at his most comfortable as the insurgent campaigner, taking on the vested interests of the establishment. The battle for the Labour leadership is good evidence of this. 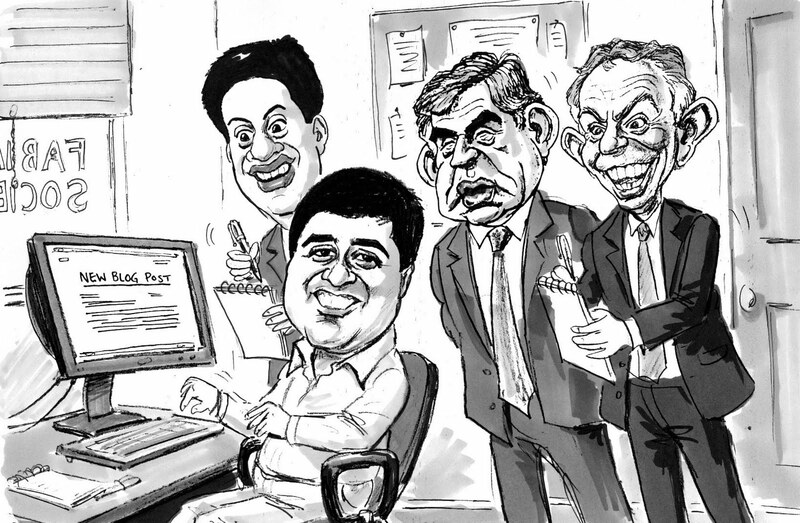 In the recent biography ‘Ed’, we learn of two incidents prior to this that shaped Ed Miliband’s political career. The first was over rent rises at University and the second was convincing the world’s Governments to come to some form of an agreement over climate change at Copenhagen. In light of this, the BskyB takeover finds Miliband where he is most comfortable as a politician while also being in tune with the public. If he can build a head of steam and present Cameron as the agent of the cosy media establishment then he can do serious reputational damage to the Government. It’s too early to say if this will have a lasting effect on David Cameron. His initial reaction, to try and spread the blame across the whole of Westminster, is a tacit admission that some damage to his reputation has been done. How bad and how lasting the damage is depends on what new information comes to light over the next few weeks and, unfortunately for Cameron, this is almost entirely outside of his control. The police are already conducting a second investigation into the affair and Cameron himself has indicated that he will be launching two inquiries. While these can be seen as a way of kicking the issue into the long-grass, inquiries can result in a story running for longer, with the results of each endlessly replayed in the media. Another challenge this week is the potential Parliamentary vote on Wednesday. Will Cameron really ask his MPs to vote against delaying Murdoch’s take-over of BskyB? Even though a recent poll shows 70% of the public think it shouldn’t happen and the Lib-Dems and some Tory MPs’ support of Labour making the vote unwinnable anyway, it is still not certain Cameron will sidestep Miliband’s clearly marked elephant trap. Though not the prize it was, the endorsement of The Sun at the next election is still worth something, hence Cameron’s slight hesitation in “declaring war” on Murdoch. Will he think the long-term gain worth the hit? Some on the Labour side are already wondering if Ed was right to jump in with both feet. Accusations directed at former News International Journalist and director of communications, Tom Baldwin may muddy the waters in the Westminster Village. But unless something really significant comes to light – and remember we’ve already established the public really don’t care if the phones of celebrities and politicians were hacked – then I don’t think this is something that will really cut through into the public consciousness. The danger for Ed is that this is all quickly forgotten over the next few months because one set of people who won’t forget are The Sun’s political journalists. One of whom recently tweeted; “NotW - RIP. A loss to 1st class journalism. Ed Miliband, Guardian and BBC; how proud you must be of your work this week”. Though this tweet has since been deleted and apologised for, clearly there are some on Fleet Street who wrongly view this as part of the on-going ideological battle in this country. For Cameron the challenges are far greater, his staunchest allies in the media are currently less popular than Nick Clegg. Cut them adrift and you’ll partly neutralise the issue. Keep quiet and risk being painted as out of touch and retoxifying the Tory brand. No room for maneuver and little he can do but wait and see what the police find. The week ahead could help define the shape of the next election. As Friday was my final day in the office as General Secretary of the Fabian Society, colleagues suggested it would be rather more in keeping with the extracurricular, and often nocturnal, musings of Next Left were I depart from this blog during the weekend. That did give me the chance to finally write something about Blue Labour, its value and limits, before finally depart from the blog by publishing the excellent Teal cartoon, above, which was an excellent leaving present from the Fabian Executive. So I am proud of the work that we have done on returning inequality to the mainstream of public and political debate, on forging an inclusive British identity, and on rethinking fairness and welfare. We hear quite a lot from our critics about what is wrong with Fabianism – but I am proud that there are today more Fabians than at any time in our 127 year history. So I hope that we have shown that the reason Fabianism endures and thrives is precisely because it has been open, plural and self-critical tradition – the only one to help generate more than one ‘clause four moment’ for Labour - committed to the importance of ideas as well as organisation in contributing to political change. Over the last couple of years, I have particularly enjoyed extending those debates online, particularly here on Next Left, as well as engaging with and writing for Left Foot Forward, for Labour Uncut, for Labour List, on Liberal Conspiracy and other sites. The British political right has had an impressive presence, and it was good to be part of an effective mobilisation of progressive voices too. Its given me the chance to write at length, not just about political events, but about political ideas, history and, as often as not, football too. Some of the pieces I most enjoyed writing last year can be found on the Orwell prize website. Across the political spectrum, the blogosphere has been good for the culture of British politics. There are many important political issues which are not going to grab national newspaper headlines. The internal cultures of our political parties, which were a response to the media environment of the 1990s, will need to change. Their first instinct is rarely to open up debates to their own members and supporters. But the civic culture of our parties is already changing for the better, not because of decisions taken at the top, but because of the commitment to engagement and debate of political blogs. Across the party spectrum, blogs including ConservativeHome, LibDemVoice, LabourList and many others feeding off and into those conversations have all demonstrated that it is possible to combine commitment to political causes with a recognition that scrutiny and challenge from within are also an important part of our politics – and that nobody intelligent should ever be 110% loyal to everything their own side says and does. At its best, these online conversations help to capture why democracy matters – that disagreement is part of who we are, and that passionately held views can be debated with civility in a way that helps all of us to reflect on, and sometimes even change, our own views too. So I'd like to thank everybody who has commented and argued about politics with me here, with a particular thank you to Stuart White for his brilliant guest blogging exemplifying precisely that democratic republic spirit. I will shortly be launching a new organisation to inform and deepen our public conversation about migration and social justice, integration and identity, promoting the vision of a strong and confident society which is fair to citizens and to migrants. It currently has its working title the 'Social Justice Communication Organisation' - though it won't be called that for long! - and please drop me a line at sunderkatwala [AT] gmail.com if you would like to be kept informed about that as our plans take shape and go public this summer in Autumn. But I hereby renounce all rights to the Next Left brand – so you can now find me personally tweeting at sundersays or contact me via Facebook too. The Next Left blog will continue here - and I look forward to hearing what Fabian colleagues and friends have to say in the weeks and months ahead. “I hate the term blue Labour” was Jon Cruddas’ opening pitch to Policy Exchange’s left and right "What is blue Labour?" think-in to explore the subject on Thursday lunchtime. [There is audio and video from the Policy Exchange site]. Cruddas didn’t offer any precise definition of the project –and suggested that the allusion to melancholy jazz didn’t do anything to help to clarify matters – but, more importantly, he did want to defend the thing itself. “I am interested in the debates it has sparked”, said Cruddas, criticising Tony Blair’s warning about blue Labour by arguing that Blair “has now become a caricature of what New Labour had been when it was a much broader political project”, instead dispensing political advice “from 36,000 feet”. Cruddas’ sympathetic advocacy, if somewhat semi-detached from Blue Labour (though a quarter-detached might be more accurate), set the pattern for the discussion involving Daniel Finkelstein of The Times and thinking Tory MP Jesse Norman from the right, while I made a final public appearance in the colours of the Fabian enemy. Our ideas of precisely what blue Labour remained fuzzy, but mostly overlapped. There was a sense that we would know it when we saw it, and could agree that it was worth talking about, even if nobody could confidently predict where it might choose to end up. I thought it was possible to identify three broad characteristics of blue Labour to date. Firstly, blue Labour offers an attitude – a dispositional conservatism of the left. This seems to me to be its primary attribute. Secondly, blue Labour offers a critique. It is good at critique. It offers a plausible critique of New Labour – that it was too hands off with the market, too hands on with the state, and had too little understanding of allegiance and identity. It is, however, a critique which in many ways echoes the early communitarianism of New Labour itself. And it has been a critique too of other strands of Labour thinking, notably Fabianism. And the critique has a twist. Blue Labour does not just make the valuable argument that, after New Labour, we needed to understand, draw on and interrogate the Labour tradition. It is also a consciously heretical critique wanting to overthrow the dominant strands of the actually existing Labour traditions that we have had. Thirdly, blue Labour has decided to be an antagonistic project, which looks to pick fights in order to start arguments within the party. This had already been one of Cruddas’ main points – the role of blue Labour’s role had been to “throw some hand grenades” to spark discussion in a party whose history of recent factionalism risked making it damagingly allergic to internal debate. Having got plenty of attention in its opening phase, this leaves open the question of how far blue Labour has the ambition or intention of seeking to offer a coherent or programmatic response. Ultimately, it may perhaps be missing the point to expect it to do so. More significant than Red Toryism? I also said that I think that Blue Labour has more potential to be politically significant than Red Toryism. Next Left has engaged extensively with Red Toryism at the level of ideas, but I have always remained sceptical as to how far Red Toryism really exists, sociologically, as a presence in British politics, beyond Phillip Blond and the ResPublica think-tank. The “modernising” centre-right strikes me as seeking to promote an economic and social liberalism, with relatively few takers for a politics which is critical of liberalism in both the economic and social spheres. The panel agreed that Blue Labour was potentially more substantive, and more interesting, than Red Toryism, a view held particularly strongly by the panellists from the right. Cruddas spoke about why he remains a minority voice in believing there is something important in the ‘big society’ idea, rejecting the idea that it is simply a cover for cuts. And Jesse Norman welcomed Blue Labour particularly because he sees it as a “Trojan horse” for progressive conservatism inside the Labour Party, particularly welcoming its critique of the post-1945 settlement. By contrast, Blue Labour strikes me as having potential to speak to a political constituency (though Anthony Painter warns that blue Labour's mainstream appeal may be limited, based on the segmentation of attitudes in his recent Searchlight report). Still, Labour requires a cross-class coalition to govern. Blue Labour was seeking to articulate one version of the identity and interests of part of Labour’s working-class constituency. Appealing to working-class votes is sometimes dismissed as a “core vote” strategy. But that intuitive definition of core vote lacks an evidence base. (As Ed Miliband pointed out in his Fabian essay during the leadership contest last summer, in 2010, DE voters were twice as likely to desert Labour as AB voters, and twice as likely to switch directly to the Conservatives when they did so. It is a rather strange “core vote” which is less likely to vote for you). In similar territory, Daniel Finkelstein suggested Blue Labour’s appeal was to “a coalition of losers”, economically and socially, going on to somewhat check the pejorative point by noting that this could have an appeal at a time when many people are losing out, and more are anxious about doing so. It shouldn’t be surprising that the left can be conservative as well as radical. The political traditions of the left have long cherished their own history and mythology. Most of my personal political heroes on the left happen to have been dispositional conservatives. George Orwell, above all, who sets out in the Lion and the Unicorn how one can combine a defence of good English and a love of the King James bible with a belief in a free India and much less income inequality. Or, Attlee, receiving the cricket scores on the Downing Street ticker tape as he creates the post-war settlement; Nehru, whose sophisticated view of identity meant he could combine being imprisoned by the Brits in the cause of independence with a fair measure of Anglophilia. Nelson Mandela too. It seems to me that the left’s dispositional conservatives have usually made more effective champions of political change than the noisier kind of lefty radical – though that has depended on their being clear about what they want to change, as well as what they believe in preserving. Cruddas talked about the charge of “nostalgia” against blue Labour being intended to marginalise it. But it would surely also be odd if at least a fair dose of nostalgia wasn’t a central part of the point of a left conservatism. There is nothing wrong with evoking nostalgia – though it isn’t quite what it used to be – but the question is what contemporary response it seeks to promote. And the attention-grabbing ‘hand grenade’ strategy of conscious agitation has been problematic. It does acknowledge what is obvious – that the Labour Party is not going to swallow Blue Labour neat, so perhaps helps to avoid falling into the politics of crying ‘betrayal’ when that doesn’t happen. But saying ‘its just to get an argument going’ also appears to be a claim that not all of the talking points are necessarily meant to be taken seriously. It offers a certain slipperiness as to what is being said and what isn’t and why. So Cruddas suggested on Thursday that Labour might want to talk about whether it had got on the wrong side of marriage tax breaks. Yet he seemed to suggest that would be as much a way to provoke a conversation about the symbolic politics of marriage than because he thinks there is much merit in the Conservative policy. I got the impression that he wants to have a contentious conversation about marriage, generally, perhaps using tax breaks to do so, rather than that he supports the policy. 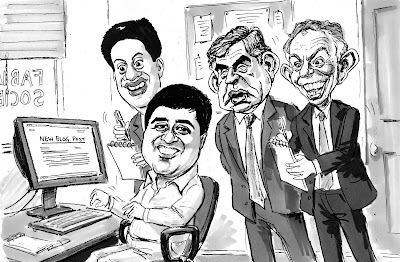 Blue Labour now worries about being caricatured – and it has at times been badly misunderstood, as with Billy Bragg’s belief that it combined market liberalism with its social conservatism. But it has also dished out caricatures itself with the broadest of brushstrokes as part of its antagonistic strategy. And it seems to be using a tactic of offering a caricature of its own argument, before retreating from it as a misunderstanding of the project on the part of its critics. What remains elusive is what is being advocated under the blue Labour banner. Yet Blue Labour is mostly rather less provocative than it likes to think. Take its deliberately eye-catching slogan of “faith, flag and family”. That could certainly not be all that a centre-left party would stand for, but ‘faith’, ‘flag’ and ‘family’ capture social themes to which the left must respond. In truth, all Blue Labour has done in these areas is rebrand and claim a set of long-running debates about identity and community in the Labour tradition which long pre-date it. There may well be more than half a point to the blue Labour perspective in each area – though it will be difficult to establish whether it strikes the a plausible balance on these issues or not since, beyond wanting to have the conversation, any particular blue Labour position has usually remained elusive. The weakness behind the “faith, flag and family” slogan – beyond the invitation to misinterpretation - is less with the advocacy of a politics of allegiance and identity, than with blue Labour’s apparent presentation of this agenda as offering a sharp, necessary and defining choice with ‘abstract’ ideological core values, including both liberty and equality. That is unconvincing. The argument for a contributory approach to welfare has been developed – in terms of both public attitudes and policy – by the Fabian champions of egalitarianism in much more depth than anything which has yet come from blue Labour. So Blue Labour here is railing against a caricature – and so risks joining advocates of a purely needs-based egalitarianism in suggesting that a politics of equality, contribution and fairness can not be reconciled, when a successful Labour egalitarianism depends on doing so. On ‘flag’ I certainly hope we’re long past the point where there is somehow a taboo frisson in the argument that the modern left should promote an inclusive patriotism. That is important for equal citizenship in a diverse society. It is a necessary foundation for a confident internationalism too. There has been significant debate within the left about this since the early 1990s, with the Fabians particularly prominent in this. There are certainly significant differences in the content of progressive patriotisms promoted by different voices – between Blair and Brown, Billy Bragg’s progressive Englishness, Tariq Modood’s plural Britishness, or ideas around the interplay between a politics of equality, identity and integration which the Fabian Society has sought to explore. The idea that this whole conversation itself is somehow simply motivated by a wish to pander to xenophobia does not strike me as engaged or serious. The “flag” problem for blue Labour is that Labour was at its most patriotic, popular and most Fabian at precisely the same moment: 1945. I irked Mr Cruddas simply by applauding when Finkelstein expressed scepticism about the political genius of George Lansbury, and what Cruddas calls the tragedy of “the assassination of George Lansbury by Ernie Bevin”. (In truth, it was rather more an assisted suicide). For Cruddas, that was the darkest day in Labour’s history. But he can’t really mean it, as I've argued before. For me, that has a fair claim to count as the second greatest day in the party’s history, since it was a necessary preliminary to the most important thing which British Labour ever did, which was providing two votes – of Attlee and Arthur Greenwood – so that Churchill had a 3-2 majority in the war cabinet in May 1940 to reject the old appeasement duo Chamberlain and Halifax in their wish to accept Mussolini’s offer to negotitate terms with Hitler. For the Labour tradition, 1945 exemplifies the politics of inclusive patriotism. The “now win the peace”moment when wartime anti-fascist solidarity helped to give us the 1945 landslide, the NHS and a check on social inequality which lasted three decades until Thatcher. These are potent myths which the Labour movement lives by – and which Blue Labour, even in the name of respecting identity, memory and tradition, offers to dispossess us, joining the right to argue that this was when the rot set in. On ‘faith’, it is useful to recall that there was a religious left before there was a religious right, in a Labour Party that certainly did owe more, historically, to Methodism than Marxism. If we are interested in building coalitions to campaign to reduce inequality at home and promote justice overseas, then it would be dangerous to be allergic to religious faith. I just don’t see the point of a culture war in which liberal academics and columnists and the Bishops of an Established Church argue on the Today programme over who can stake a claim to be a persecuted minority in our society. The Labour Party was in many ways a vehicle for the secularisation of the core ethic of the Judeao-Christian tradition – the spirit of a New Jerusalem speaks to atheists, agnostics and believers alike. That could inform Labour’s future as well as its past. It would entail an acknowledgement that the question of where the scope and limits are of faith in law and public life in a society committed to respecting the human rights of all is complex, and subject to political deliberation. The challenge here is to show that this is compatible with core values of equality and human rights. On ‘family’ too, the left has struggled to articulate what it thinks. It is not at all difficult to see how one can still frame debate about “family values” in a way which would create a culture war within the Labour Party and the liberal-left. If that is where blue Labour ends up, then it is likely to be rejected within Labour, and would probably repel more support than it gained should it prevail. But it should also be possible for modern social democrats, liberals and conservatives to debate a pro-family public policy which does not do that – and which is as interested in its practical as its rhetorical support for families. My Fabian colleague Tim Horton has set out, in a 'family' special issue of Fabian Review no less, how a social democratic politics of the family would be interested in protecting family relationships from economic pressures, such as working time. That is the sort of territory where blue Labour and social democracy might well coalesce, and where progressive Conservatives could face tricky trade-offs as to whether or when markets can be checked in the name of another social good. I think Blue Labour does have a difficulty in explaining what it thinks of the advance of feminism. (There has also been an insufficient engagement between Red Toryism and feminism). That was one of the points made by Helen Goodman in a highly vigorous and aggressive critique of blue Labour. I don’t have anything like as negative a view of Blue Labour’s discourse as Goodman. But I do share her dismay at Maurice Glasman’s extended metaphor of the Labour tradition as a marriage which broke down because middle-class mum emasculated working-class dad. This has always struck me as pretty hopeless, and I was surprised that it took quite a long time for it to become contested and publicly controversial. It seems to me bad history and poor politics – and it does leave blue Labour wide open to what I hope they can tell us would be a misinterpretation. Everything Glasman likes is in the male camp and everything he dislikes (Fabians, the LSE and social science, the Church of England, etc) is in the female camp. So why offer us this gendered analogy to problematise a history of power relations in a Labour Party from which women were largely excluded? It does sound as if it believes all of Labour’s problems have been created by a post-1968 feminism, personified by Harriet Harman. If that isn’t the argument, then it would be good to say so, and to rethink the animating metaphor as well. More recently, blue Labour thinker Jonathan Rutherford has written about the value of patriarchy. When I mentioned this on Thursday, Jon Cruddas was keen to say that he hadn’t done so, or had been misrepresented. I went back and re-read Rutherford’s Total Politics article “Putting Patrimony First”. Labour in England is losing the class and culture it grew out of, and which enabled its immersion in the life of the people. That culture was about community, work, patriotism and a sense of honour. Above all, it was about men. In the last three decades all of this has been irrevocably changed. Labour's patrimony, which was the loyalties, values and culture of work that fathers handed down to sons – and daughters too, but Labour has been a deeply patriarchal movement – is dying out. Labour has to find new ways of speaking to men as workers, husbands and particularly as fathers. What does it mean to be a good father? In our age of social liberal attitudes about gender equality few Labour politicians speak about the virtues of manliness and fatherhood. But the lodestar of the early Labour movement was a manliness whose virtues were justice, prudence, temperance and courage. We need to reclaim them because they still matter, and they're key to rebuilding Labour's relationship with the country. Perhaps I am missing the point, but I couldn’t understand how the pro- patriarchy argument helped with the contentful argument, beyond being likely to provide another example of the ‘provocation-misunderstanding-ambiguity’ blue Labour cycle. Can Blue Labour develop a manifesto? But that was blue Labour phase one. If it intended to do more then blue Labour will need to move from critique to advocacy, and to explain whether it is a perspective with a distinctive position on the defining political issues of the day. It is not clear what Blue Labour will have to say about the deficit, about taxation, about spending cuts. Perhaps these are not primary issues in the Blue Labour worldview – but it risks being a marginal political project if it doesn’t have much to say about them. What is the Blue Labour view of markets and the state? The core motivation of Blue Labour would be around political economy. So far, beyond campaigns for a living wage, that has sounded like a cross between Will Hutton’s stakeholding and the German social market economy. Daniel Finkelstein suggested that its anti-statist ambitions would end up in the advocacy of more state. Or can it make other means tangible, in its ambition to check and entangle footloose capital? (Its central idea involves not commodifying things where other principles should be trumps. So, despite being against the state, it was proud to campaign to keep the forests in state ownership). Blue Labour can often sound like it sympathises with the (now rather marginalised) Labour Eurosceptic tradition of Peter Shore. But does it think we should significantly renegotiate the terms of British membership of the EU, or does it recognise the limits of “blue Labour in one country” and seek pan-EU agreement on labour market conditions and rules? Blue Labour doesn’t like immigration, but Maurice Glasman has campaigned with London Citizens for the regularisation of illegal immigrants who are already here. How anti-liberal is Blue Labour? Most of us agree with approaches to promote communitarianism, community spirit and shared citizenship wherever these are compatible with liberalism, are not oppressive and always protect the right to exit and dissent. That is the motherhood and apple pie politics of promoting volunteering, and so on. Does Blue Labour want a thicker communitarianism than this? I rather doubt that Blue Labour will succeed in becoming programmatic, partly because I guess it is not strongly motivated to do so. It seems interested in the political conversation, and in means more than ends, and it has enriched our debates in the Labour party by doing in that way. At its best, Blue Labour is pluralist – seeking to broaden the Labour conversation, extend the party’s reach, including worrying about whether a narrow metropolitanism and the politics of the litmus test prevents Labour’s traditional supporters from seeing it as their vehicle for social change, as it has been across the last century. I find Maurice Glasman most persuasive when he is promoting a Labour “politics of and” (to steal Tim Montgomerie’s term from his own advocacy on the centre-right), and when he is arguing for what he is for, rather than what he is against. Labour is a paradoxical tradition, far richer than its present form of economic utilitarianism and political liberalism. The Labour tradition is not best understood as the living embodiment of the liberal/communitarian debate, or as a variant of the European Marxist/Social Democratic tension. Labour is robustly national and international, conservative and reforming, christian and secular, republican and monarchical, democratic and elitist, radical and traditional, and it is most transformative and effective when it defies the status quo in the name of ancient as well as modern values. In this mood, Blue Labour has a good deal to offer the Labour conversation, though I suspect it might be more effective on symbolic issues than in doing much heavy lifting on issues like tax and spend. What are the issues on which I feel most Blue Labour? Well, if we could get the FA Cup final played in its proper place, after league football season finishes, not before it; get Test Cricket back on free-to-air television, and protect post offices, the universal postal obligation and red post boxes, then I would be keen to lead those Blue Labour campaigns, without any fear of encroaching on the very real progress which has made Britain more civilised – such as offering equal rights to gay people instead of putting them in prison, being considerably less racist, and so on. At its worst, Blue Labour can be less pluralist, instead sounding as it offers a narrow factionalism of its own. In this mood, Blue Labour seems rather too focused on the politics of excommunication, offering a highly antagonistic yet imprecise grumbling about feminism, an arid caricature of a monolithic Fabianism, and of the liberal traditions which have also always formed part of Labour’s political inheritance too. This often refuses to acknowledge how often so many similar points have been made within the enduring and revisionist Fabian tradition itself, and caricatures the Labour Party membership as a hyper-metropolitan group scared to even talk about the issues which Blue Labour wants to put on the agenda, when these live debates pre-date the blue Labour project. Moreover, if we were to ditch the enduring utopian and pragmatic forms of actually existing gradualist socialism and social democracy, it will take rather more than a romantic appeal to lost leaders and paths not followed. Celebrating some great romantic traditions of the movement, which is great, but there are limits to Lansburyism, and not where it seeks to evade genuine political choices by doing so. But then Blue Labour knows that it isn’t going to get everything it wants. And I guess that’s why they call it the blues. Sunder Katwala is the departing General Secretary of the Fabian Society. This is his final substantive Next Left post in the role.